Take into account the things that people do and compromise for you. You don't know what they went through to try and contribute to your happiness. Be grateful. Be thankful for everything you have. If you concentrate on what you don't have you will never have enough. Contentment is Riches. Not all that glitters is gold. Don't be intimidated by Facebook captions. While some are real, most are unrealistic facade. Be Grateful, appreciate God for the little you have. No matter your situation, your blessings always outweights the disappointments. Be grateful. Being grateful for the things that you have and for the people that are in your life that push you to do better with positivity, is one of the most admirable traits that a person can have. There are many ways that a person can be grateful and to show others that they are grateful for them. One way tip towards being grateful to the life you have is to think about how much that you actually have, instead of thinking about the things that you don’t. Spending your time moping over the things in your life that aren’t exactly how you want them to be will take you away from blessings that you could have received but were instead blocked from because you were spending your time being negative. 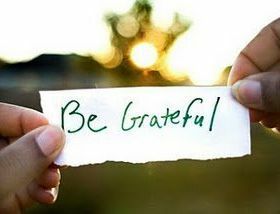 Another helpful tip to show that you are grateful is to vocalize it. Thank people out loud for being positive forces in your life, don’t be afraid to show that you are grateful for a great life, because truthfully, things could be way worse.